Summer Fun is our version of camp. It provides local children with an experience of both learning and fun during the hot days of summer. 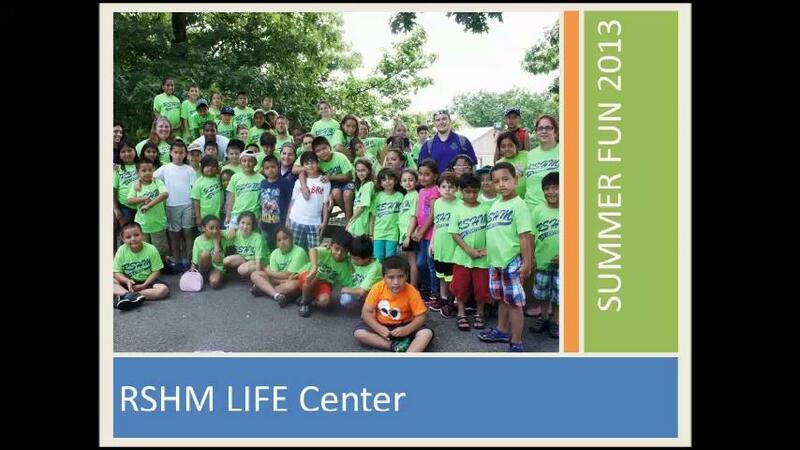 The RSHM LIFE Center’s summer camp provides an engaging place for the children to spend their free summer time, enabling their parents to work with peace of mind, knowing their children are safe and happy. It is a five week program which balances fun and learning, designed so that the educational pieces are transparent to the children while they play, swim and have experiences that their families would otherwise not have been able to provide for them. The program includes traditional camp sports, arts and crafts, board games and music, as well as time for reading, writing and math each day. Twice a week we spend the entire day outdoors at Mariandale. In this beautiful setting overlooking the Hudson River, the children swim in the outdoor pool, picnic for lunch and play group sports, giving them an opportunity to interact with children in other age groups and develop a sense of caring for those outside their immediate circle. We have talent shows and fun theme projects. Past themes have included Medieval life, space and science, books that became movies, exploring the continents, wildlife and dinosaurs. As the children research their theme and work on their presentations, they don’t realize they are building on the concepts they have learned all year strengthening their language and computer skill development. Our camp is staffed by adults, most of whom are our regular After School staff. Each week we take a trip, mostly to places the children have never experienced before. The children are riveted by the new exposure. Each field trip and adventure helps us achieve our goal of fostering self-esteem, respect for others and an appreciation of the arts, sciences and care of the planet. The Hudson Valley Challenger Space Center, Bronx Zoo, Medieval Times, Maritime Aquarium, Liberty Science Center, bowling, Renegades Baseball, NY Hall of Science, Ringling Brothers Circus, Playland and Field Station Dinosaur are just some of the places we have visited in recent years. Each summer is more exciting than the last!